Get 100% more boom in your room for 76% of the price from now until 8/31/17. Why get a sub? The real question is “Why not? !” Much of today’s pop, hip-hop, and EDM puts a heavy emphasis on bass elements, and folks often listen on bass-heavy systems. With that in mind, it would be a disservice to your clients if you didn’t have a sub to know how well your mixes will translate to these listening environments. Both Temblor models (The T10 and T8) offer balanced and unbalanced connectivity and are fully featured with controls for Input Gain, adjustable Low Pass Filter, and phase inversion. 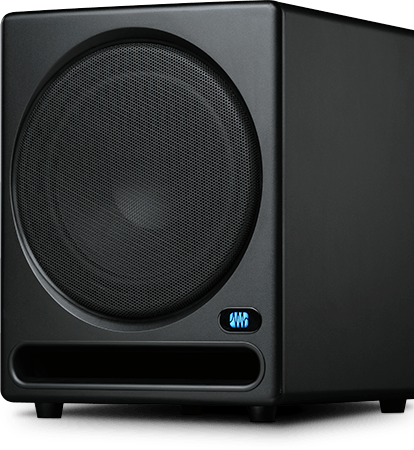 The T10 even comes with a footswitch that allows you to engage the subwoofer momentarily for quick bass-checks. Nice! BONUS: Interested in the best way to set up your monitors and subwoofers? Click here for the latest edition of our Brief Tutorial on Studio Monitors. Here’s producer/songwriter Joe Solo hanging out with Matt Conrad, PreSonus Quality Test Lead, at the PreSonus booth back at NAMM. Joe was kind enough to spend some time sharing his thoughts on the Temblor T10 subwoofer and Sceptre S8 monitors. This isn’t so much a review as much as an enlightened conversation that offers a wonderfully complimentary set of perspectives; that of of a seasoned producer and a quality control expert. Check it out! When not talking shop at our NAMM booth, Joe offers a ton of valuable insight for making it in the music business. To sign up for Joe’s FREE Music Success Video Nuggets and weekly tips email, go to www.joesolo.com. You can also get more info via the Music Success Workshop on Facebook. Temblor T10 Active Studio Subwoofer Gets a 5/5 from Sounds and Gear! “I love the sound of it, it’s got a really deep, tight sound, and even if you turn it up loud, it doesn’t sound flabby. It sounds like the cabinet is built well. Head on over to Sounds and Gear’s YouTube channel for more great reviews and tutorials! I got to tell you, I went out into the shop to test that Temblor 10 this afternoon. We have a 50,000 square foot shop, and I was testing it to see if the build’s hardware would rattle with some significant low-end pink noise in our various positions around the exhibit. Fortunately, it didn’t, but I had about 30 men stop their work and get nervous. Many came over to find the source of that low-frequency rumble that was literally smashing the shop into fear of a literal earthquake. It’s pretty impressive—a single T10 in that space—and it’s all we could hope for in this application. It performed flawlessly, venting its heat without trouble. It did a great job of rumbling the floor in the briefing room when we put the port in the cable space. It’s amazing, and it certainly outperforms my JBL 15 with 2700 watts of power. I know. Doesn’t seem right. But that’s what it does. For more on the Temblor, click here. 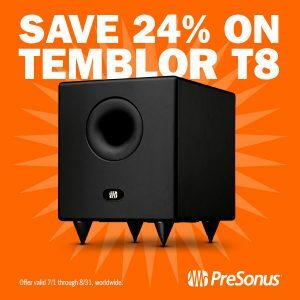 Check it out—here’s Dave Bryce, showing you the best way to set up your Temblor T10 Subwoofer in your studio. While a lot of subwoofer marketing verbiage talks about “room-shaking” bass, the fact is that’s not all hype. Subwoofers REALLY DO shake the room, and can resonate the environment at specific frequencies, creating sounds that aren’t actually coming from your speakers. This makes mixing critical low-end frequencies impossible, as you aren’t hearing an accurate representation of what you’ve recorded. The solution is to systematically test your sub in YOUR environment, and work out the kinks to get the most accurate-sounding configuration possible. The Temblor T10 makes this very easy, and Dave is here to help. Take a look! For more on the Temblor T10 subwoofer, click here.